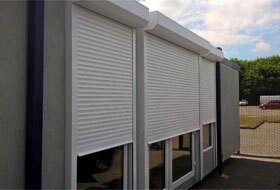 Heavy duty galvanised steel commercial roller shutters for windows and doors with solid or perforated curtain. Galvanised steel industrial roller shutters with or without insulation especially resistant to damage and deflection. Fire shutter doors providing fire protection and security available with a 1, 2 or 4 hour rating to cover most requirements. Robust aluminium domestic roller security shutters for protection of windows, patio doors, and front or rear doors. Protection of stock behind bar, counter or servery, with manual or electric, solid, perforated or slotted lath curtain. Security shutters and perforated grilles not only provide an excellent barrier against intruders but also deters vandalism. At Security Shutters Manchester we can provide external or internal roller shutters across the Manchester region including Bury, Oldham, Rochdale, Stockport and Saddleworth. Whether you are securing your premises on a daily basis or for a longer period such as a holiday, by installing roller shutters across a door or window it not only helps to deter and prevent a burglary from occurring in the first place, it also stops the damage caused by vandals breaking glass or damaging the door. In either case roller shutters can provide that valuable peace of mind that the investment you have made in your property is securely protected. We survey, supply and install either manual or electric roller security shutters or for home or commecial and industrial business premises including internal bar servery, kiosks and counters, schools and offices. We can also install fire shutters which provide a fire rating of up to 4 hours. All come with either with a standard 'mill' finish or a fully powder coated colour. You can view the range of colours here. Our security shutters can be installed with solid, perforated roller shutters, punched or glazed vision roller shutters for doors or windows. For high security situations we can supply a range of Excel security roller shutter doors tested to conform to the police Secured by Design standards and those recommended by insurance companies. All our security shutters comply with the current Construction Product Directive and are fully CE Marked to comply with regulations that assure you of receiving a quality product. The type of installation you need will depend on your premises so our security shutters are made to measure to fit your exact opening, whether on domestic, commercial, office, industrial, leisure or school roller shutter applications. Our vision roller shutters can assist with planning permission approval as they can be as more aesthetically pleasing than a solid shutter. As a local company we can provide a quick secuirty shutters installation service across the Manchester region including Bury, Oldham, Rochdale, Stockport and Saddleworth. All products are CE marked and compliant with the latest European product directives. A selection of products tested to Loss Prevention Certification Board (LPCB) Level 1. A choice of built-in and built-on products. Wide choice of colour and finishes including graphics to make your shutter unique. Choice of operating functions both manual and electric. A warranty to provide you with peace of mind. We are members of the Construction Industry Training Board (CITB) and accredited by the Contractors Health & Safety Assessment Scheme (CHAS) and achieved accreditation from Alcumus Safecontractor for our commitment to achieving excellence in health and safety. Staff hold current CSCS Health & Safety and Roller Shutter Installation Cards for the construction industry, all reflecting our experience as roller shutter doors installers. We are also members of the Federation of Small Businesses (FSB). We are members of the Oldham Council ‘Buy with Confidence’scheme which are both managed by the respective Trading Standards Departments. 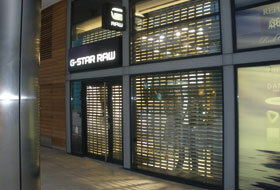 First choice for security shutter installers Manchester area. Bar shutters, domestic security shutters, security grilles, fire doors, window grilles, commercial shutters, office roller shutters and security school roller shutters doors supplied and installed throughout Manchester, Rochdale, Bolton, Oldham, Bury, roller shutters Saddleworth, security grilles and roller shutters Stockport, Saddleworth, Chadderton and Bramhall. © Security Shutters Manchester are part of Alliance Security Installations Ltd. All Rights Reserved.